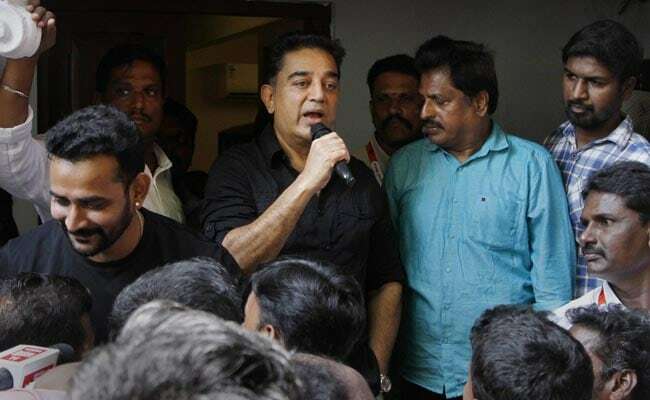 Kamal Haasan had last week said he would launch his political tour on February 21 from the residence of former president, the late APJ Abdul Kalam in Rameswaram in Ramanathapuram district, which also happens to be the actor's native place. Chennai: Days after announcing his decision to set out on his political journey next month, actor Kamal Haasan today said that his plans to reach out to the people are ready and will be implemented. Today, he held a meeting in Chennai with fans from districts, including Ramanathapuram and Madurai, which he will cover during the first phase of his planned tour. "The welfare work will grow manifold and like before it will be exemplary and plans for this have been devised and we are going to implement it," he told them, referring to the task on hand to connect with the people. He said the journey will be a "model" that will shed light on the road ahead and the goal as well. Kamal Haasan said the welfare work would grow commensurately and hailed his fans as "heroes of welfare work." From being fans, they were now moving towards the next phase, he said. "A duty and necessity to move you towards the next phase has now come to me," he said. Welfare activities were nothing new and being done for the past about 35 years. Now it was going to get more intensified, he added. The actor also asked his fans to be accommodative as new "brothers" will now join them. "You have been with me for so may years and more brothers are now going to join us. You should guard the dignity that you are seniors and should take them along," he said. He dismissed as rumour a claim that he will be addressing his first public meeting on February 24 in Madurai. Mr Haasan said the itinerary of his tour for February 21, 22 and 23 will be later announced. Later, participating in a Canara Bank branch opening function, Mr Haasan said he was confident that he will get many "brothers" in his journey which would be the starting point to bring out the pride of India from Tamil Nadu. "The days are not far when we will be pioneers in the world in digital technology including in sectors like banking, education and entertainment," he said adding "I will see that happening in my lifetime." Digital world was the pathway for the youth, he said and expressed confidence that no village would be left out of this digital age and the crowd from cities will ease. A day would come when people will say happily that they live in villages with all amenities including health care facilities with progress in digital technology, he added. Announcing his political tour in his weekly column in Tamil weekly "Ananda Vikatan" on January 18 last, the actor had said he too shared the vision of the late APJ Abdul Kalam who dreamt of a "good Tamil Nadu." By launching his tour from the residence of Dr Kalam, he would be moving forward towards that goal, he added.